The prelude on Sunday comes from French composer Charles Marie Widor’s Symphonie Gothique, mvt. II op. 70 (Andante sostenuto). For Widor, his organ symphonies were a symbolic way of communicating his spiritual insights and Christian faith. 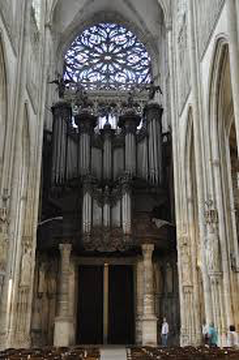 Written in 1895, the Symphonie Gothique was based on the liturgical theme “Puer natus est nobis” (Unto us a child is born), and inspired by the magnificent Gothic basilica of Saint-Ouen at Rouen, France. The Andante sostenutowas considered by Widor’s student Albert Riemenschneider, as well as French organist Marcel Dupré, as a piece that evoked the serenity of the church’s interior. Riemenschneider wrote in a program note that the Andante sostenutowas a “rare movement with a spiritual content so chaste and pure that involuntarily the atmosphere of prayer and incense suggests itself.” So fittingly, Andante sostenuto is offered this Sunday as we begin our worship together to gather our prayers for us and the world. May they rise like incense.